This Sunday, Ukrainians were choosing their future president from a record list of 39 candidates. But true rivalry was unfolding among three figures: the incumbent president and chocolate oligarch Petro Poroshenko, a former twice-PM Yulia Tymoshenko, and a dark horse front-runner, comedian with engineering background and no political experience Volodymyr Zelensky. The three represent three trends in Ukraine’s electoral politics. The first trend is the importance of staying the course toward the West in general and Europe in particular. Petro Poroshenko incarnates this electorate prerogative. The people who chose to vote for him weighed both negative and positive outcomes of his 5 years’ presidency, and focused on the latter. Poroshenko also undermined his political credibility with a botched larger anti-corruption campaign. Anti-corruption procedures for government and parliament members were devised and new institutions were bolted up at the urging of the West. Numerous court investigations ensued, yet with few indictments to show for. A case in point was a controversial police reform. It started as an anti-corruption effort in response to the demands of 2014 Maidan, by firing the old-time police staff and hiring new blood on the Georgian model by Georgia’s former president Mikhail Saakashvilli (who himself was hired by Poroshenko as governor of Odessa region). However, not even a year into the reform, the old policemen were hired back again and the reform stalled. A recent defense procurement corruption scandal, linking people in the president’s immediate circle to money laundering through defense contracts with Russia, is one of the latest episodes of a 5-year-long saga. President’s own image as a chocolate baron who took years to sell his factory in Russia only made things worse. In economic and monetary policy, the president is seen as unable to control high inflation or to reverse the devaluation of the hryvna. The popular response to income decline and collapse of already modest living standards (an average pension oscillates around 100 euros a month), beyond presidential vote, are people voting with their feet, as millions have emigrated from the country for economic reasons, with Europe and Russia as top destinations. Poroshenko’s role as commander-in-chief of Ukrainian Army is a blessing and a curse for his candidacy. On the one hand, he poses as a defender of the nation. On the other he takes the blame for the war record of the last 5 years, including the non-recovered territory, the loss of 11 000 lives and counting, a political impossibility of fulfilling the Minsk Accords, and atrocious living conditions for Ukrainians in the occupied territories. It is also increasingly clear to the electorate that the Crimea is lost for Ukraine and a « frozen » conflict in Donetsk and Lugansk is there to last. The popular fatigue from the war translates into a loss of votes for the incumbent. However, a large part of Ukrainian population which will vote for him today do so based on a record of positive achievements, including important wins for Ukraine’s foreign policy in relations with the West. Poroshenko’s foreign policy trump is a set « course » toward Europe as a civilization choice for Ukraine. This is supported by an overwhelming majority of Ukrainians (including those who live and work in Europe on a temporary basis and those who do not vote for Poroshenko). One of the most important outcomes of staying the “course” is the implementation of the Association Agreement, resulting in Ukraine’s trade with Europe exceeding that with Russia, against all odds. Another popular achievement is a visa-free entrance to the EU for Ukrainians, of which thousands of people have taken advantage to travel and work in Europe. A critical result in foreign policy is a newfound importance of Ukraine for the West, with a resulting restoration of Ukrainian army through the US, Canadian and NATO assistance. Poroshenko seeks to capitalize on the military achievements posing as the politician able to stand up to Putin and Russian aggression. The latest decisive score in foreign policy the current president set on the religious front. The official recognition of Ukraine’s Orthodox Church with the help of Constantinople, against a staunch opposition from Moscow, set a milestone in Ukraine’s hybrid war with Russia beyond realism. In addition to being a brilliant diplomatic gambit, Tomus brought the decisive popular support to Poroshenko’s feeble opinion polls ratings since the end of last year. The second trend is a long-lasting value of populism, which is also true in Ukrainian politics. This trend is reflected in the person and the program of Poroshenko’s contender breathing down his neck for the second place in April run-off: Yulia Tymoshenko. Ex-PM twice, a veteran politician and a decade-long rival of Poroshenko’s, her electoral base consists mainly of older people who remember her former populist acts such as « Yulya’s thousand », a form of extra social payments, especially appreciated by the retired population. After a time in jail following the 2009 gas deal with Russia, which left Ukraine at a major long-term contract disadvantage, and a long recovery time in the hospital following her release, Tymoshenko returned to the helm of her Batkivshchyna party. Her campaign is based on populist promises (a proven recipe). Although she looks more likely to lose to Poroshenko than the other way around and thus leave the race after the first tour, opinion polls may not reflect a true situation in the Ukrainian village, which may show greater support for Tymoshenko than expected. If she loses the first round and decides to contest the results, she may count on an active base to support her in the streets. 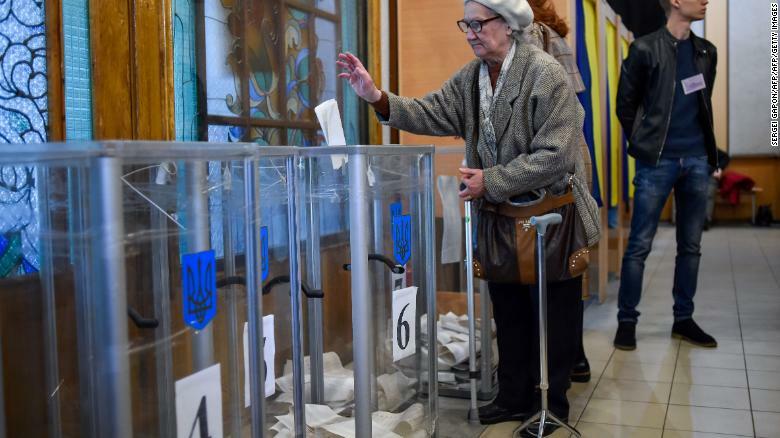 More importantly, no matter the outcome of the presidential elections, her party will weigh heavily in the tricky balance of Ukraine’s parliamentary elections in the fall. The third trend in Ukraine’s politics is a demand for novelty. It has translated into the figure of the people’s favorite candidate: the dark horse and leader of the first tour of the elections Vladimir Zelensky, perceived by the analysts, and by the voting public, as a vote “against all”. Zelensky is leading the polls with the image of the only true alternative to the corrupt old-timers, the only candidate who will think about the people and not about himself, and the only one “of the people”. The image of TV president, which he has cultivated through the popular TV series Sluha Narodu is at the heart of the popular perception of this new figure in Ukrainian politics. Zelensky has bet his campaign on it, touring the country with concerts where he mocks the opposition with his team of fellow-comedians, communicating through Instagram, YouTube, and TV shows. He downplays his lack of experience (which is not a concern for his under-40 supporters who are mostly protest voters) by stressing his origin of an ordinary person, and not an old political elite product or an oligarch. The problem is his oligarchic backing: Ihor Kolomoisky from Dnepropetrovsk Region, the owner of the TV channel broadcasting Zelensky’s shows. Thus, political analysts in Ukraine warn of a puppet president in case of his victory. Outside of the actual rivalry for the presidency, the most important candidate in these elections from the historic perspective is Yuri Boyko, who has no chance of making it to the second tour with around 10% of support according to polls. His standing is of historic importance though, as it is the lowest an openly pro-Russian candidate has ever received in Ukraine’s presidential elections in a normal course of power transfer (2014 elections considered exceptional in that regard). Boyko represents a traditionally important political force now weakened permanently in Ukrainian politics (ironically by Russia’s actions): that of pro-Russian candidates. The significance of the first tour results, beyond deciding who will fight for the presidential seat in the run-off, is the configuration of the parliamentary elections in the fall. 8 to 10 parties are expected to pass the electoral threshold, with none of them holding majority and Ukraine’s parliament bound for coalition-building. Who has most supporters is key, and media visibility is an important dividend of the campaign effort for the now losing candidates. For the presidential winner part of the outcome of the parliamentary elections will also be per-decided now: 50% of Ukraine’s parliamentarians are single-district candidates (majoritarian), who are often business people not belonging to any party interested in good relations with the government. Previous presidential and parliamentary elections have shown that these MPs will back the party of the winning presidential candidate later in the parliamentary elections. Overall, Ukrainian political landscape on the election day reflected key trends of today’s European (France, Italy) politics: introduction of a new political party “of and for the people” (Sluha Narodu party) based solely on the image of a new, young and inexperienced leader (Vladimir Zelensky). The young and inexperienced leader himself, representing the underdog forces standing out against the establishment (Petro Poroshenko and Yulia Tymoshenko) and bringing with him a promise of hope.